With all the winter weather and cold temperatures we have had so far this season, remember that with every hour your furnace is running, your furnace filter is collecting dust and other debris from the air in the home. A dirty filter will not only decrease furnace efficiency and increase your overall heating bill, a dirty filter can cause your furnace to malfunction (typical symptom, furnace cycling on and off for short periods of time during the heating process). NEV-CAL recommends you check your filter regularly and replace or clean when dirty (minimum twice per year if using system for both heating and cooling). 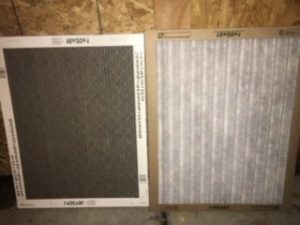 The filter on the left in the photo below is dirty and was removed from a furnace that was not properly operating. 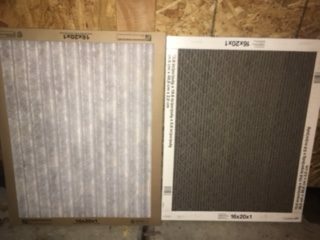 The installation of a new filter (right) resolved the problem and will help prolong furnace life and keep energy bills lower.